On May 16, 1960, Theodore Maiman shined a high-powered light at a ruby partially coated with silver and the result was the world's first laser. This groundbreaking device, however, was not created by a single genius in isolation. Rather, it was the result of many brilliant minds sharing ideas . . . at least until it was time to divvy up the profits. Most historians trace the development of the laser back to Albert Einstein, who, in 1917, was engaged in one of his "thought experiments," this time over the phenomenon of energy emission. As described by others: "If an atom is in an excited state, it may spontaneously decay into a lower energy level after some time, releasing energy in the form of a photon, which is emitted in a random direction. This process is called spontaneous emission." Believing that if just the right photon were available "as light passes through a substance, it could stimulate the emission of more light: "Einstein postulated that photons prefer to travel together in the same state . . . . If a stray photon of the correct wavelength passes by . . . its presence will stimulate the atoms to release their photons [called stimulated emission] . . . and those photons will travel in the same direction with the identical frequency and phase as the original stray photon. A cascading effect ensues: as the crowd of identical photons moves through the rest of the atoms, ever more photons will be emitted from their atoms to join them." In 1928, Rudolph W. Landenburg confirmed Einstein's theory of stimulated emission, and the quest for what eventually becomes the laser began. Note there is a fundamental difference between the two types of emissions: when one occurs spontaneously, energy is released randomly and at a variety of frequencies; but, when it is stimulated, the energy released will mirror the frequency and travel in the same direction as the stimulating photon, with the effect being able to "amplify" the original input of radiation energy. This ability of a stimulated emission to remain focused on a very narrow range of frequencies, itscoherence, is the key to making amplified electromagnetic radiation useful as a communications tool (as well as an intense source of energy): "Previous sources of light energy such as incandescent lamps, are "incoherent" sources since they simultaneously generate energy over a relatively large part of the electromagnetic spectrum. Radio frequency sources, on the other hand are very coherent. The advantages of a coherent source are many [and include the ability to] . . . obtain information from a desired source while filtering out all others. If your favorite radio station were to broadcast over a broad part of the spectrum (that is if it . . . were . . . incoherent . . .) you would experience interference. . . ."
At first, scientists' ability to amplify and generate energy was limited to the lower- and mid- range of theelectromagnetic spectrum, which spans from the lowest frequencies: "Where your AM receiver operates. Progressively higher frequencies are termed short wave; VHF (for very high frequency) containing the FM and TV bands; UHF (for ultra high frequency); microwaves, where most radars operate; infrared or heat waves; light; ultraviolet, X-rays, gamma rays and finally cosmic rays." In 1954, Charles Townes and Jim Gordon of Columbia University in the U.S., and Nicolay Basov and Alexsandr Prokhorov in Russia, separately developed the precursor to the laser, the MASER, short forMicrowave Amplification by Stimulated Emission of Radiation, which amplified microwaves. Of limited use, Townes and his future brother-in-law, Arthur Schawlow, came up with a plan, published in the Physical Review in 1958, to amplify higher frequency infrared and visible light, whereby: "The prototype laser [was to] be fitted with a pair of mirrors, one at each end of the lasing cavity. Photons of specific wavelengths would then reflect off the mirrors and travel back and forth through the lasing medium. By doing so, they would in turn cause other electrons to relax back into their ground states, emitting even more photons in the same wavelength.. . ."
The Townes-Schawlow proposal stirred Theodore Maiman of the Hughes Research Laboratory in Malibu, California, who, on May 16, 1960, was the first to successfully amplify radiation from the visible spectrum: "A light source, in the form of a powerful flash tube lamp, irradiates a synthetic ruby crystal [with two parallel faces coated with silver] which absorbs energy over a broad band of frequencies. This optical energy excites the atoms to a higher energy state from which the energy is reradiated in a very narrow band of frequencies. The excited atoms are coupled to an optical resonator and stimulated to emit the radiation together…"
Although no bright beam of light was emitted in the first demonstration of laser power, as Townes noted, the device was, nonetheless, a laser because it produced energy with: "A marked narrowing of the range of frequencies that it contained. This was just what had been predicted [by the 1958 paper, and was] definite proof of laser action. Shortly afterward, both in Mainman's laboratory at Hughes and in Schawlow's at Bell Laboratories in New Jersey, bright red spots from ruby laser beams hitting the laboratory wall were seen and admired . . . ."
One early member of Townes' team was Columbia University graduate student, Gordon Gould, who devised a number of ideas relating to "'pumping' atoms to higher energy states so they would emit light" for his graduate thesis, which he shared with Townes. 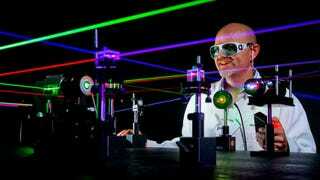 In fact, it was Gould who first coined the phrase Light Amplification by Stimulated Emission of Radiation (LASER). Anticipating that his ideas would be subsumed into Townes' research, Gould began, in 1957, keeping records of his ideas, even going so far as to have some of the pages of his notebooks notarized. As their respective ideas and proposals became crystallized, both camps rushed to preserve their rights: "Gould filed a laser patent in April 1959 but this was denied by the US Patent Office in favor of the Schawlow and Townes optical maser patent (awarded 1960)…"
Not as unfair as it sounds, Townes and Schawlow had applied for their patent, on behalf of Bell Laboratories, nine months before Gould filed. In any event, after the patent was awarded to Bell, a "Thirty Year Patent War," began with Gould filing suit. The litigation dragged on, but finally, beginning in 1987, Gould began winning settlements on his patent claims. By the end of the legal battle, Gould was ultimately awarded "48 patents . . . for commercially valuable aspects of lasers. . . ."
Melissa writes for the wildly popular interesting fact website TodayIFoundOut.com. To subscribe to Today I Found Out's "Daily Knowledge" newsletter, click here or like them on Facebook here. You can also check 'em out on YouTube here.